In many countries throughout the world, young people are speaking out. They are using their voices and bodies to redefine the boundaries of the possible and to protest the crushing currents of neoliberal regimes that ruthlessly assert their power and policies through appeals to destiny, political theology, and the unabashed certainty bred of fundamentalist faith. From Paris, Athens, and London to Montreal and New York City, young people are challenging the current repressive historical conjuncture by rejecting its dominant premises and practices. They are fighting to create a future inclusive of their dreams and the principles of justice and equality become key elements of a radicalized democratic and social project. At stake in their efforts is not only a protest against tuition hikes, austerity measures, joblessness, and deepcuts in public spending, but also the awakening of a revolutionary ideal in the service of a new society. In short, youth have dared to call for a different world and, in doing so, have exhibited great courage in taking up a wager about the future made from the standpoint of an embattled present. 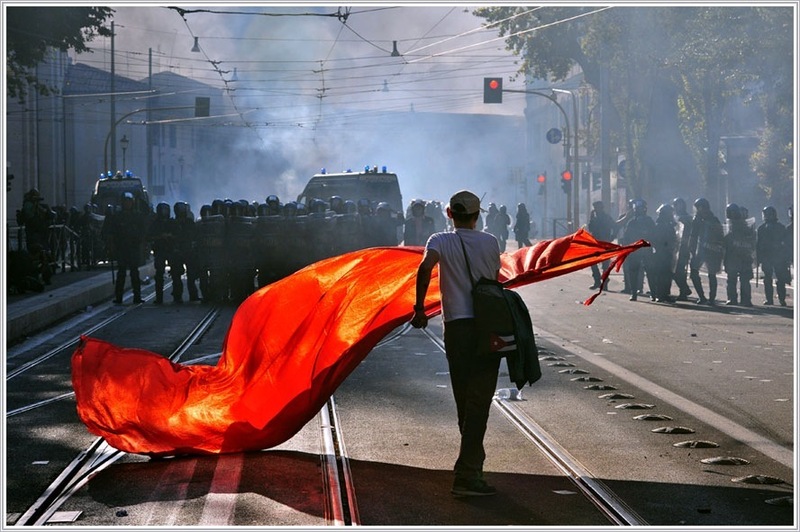 To understand the shared concerns of the youthful protesters and the global nature of the forces they are fighting, it is crucial to situate these diverse student protests within a broader analysis of global capital and the changing nature of its assaults on young people. Unapologetic in its implementation of austerity measures that cause massive amounts of human hardship and suffering, neoliberal capitalism consolidates class power on the backs of young people, workers, and others marginalized by class, race, and ethnicity. Neoliberal capitalism appears to no longer need the legitimacy garnered through its false claim to democratic ideals such as free speech, individual liberty, or justice — however tepid these appeals have always been. 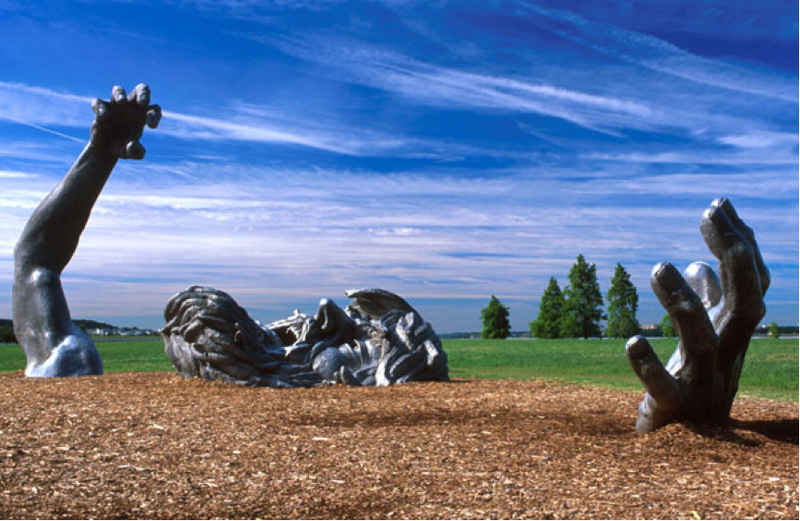 In the absence of alternative social visions to market-driven values and the increasing separation of global corporate power from national politics, neoliberalism has wrested itself free of any regulatory controls while at the same time removing economics from any consideration of social costs, ethics, or social responsibility. Such a disposition is evident in the fact that neoliberalism’s only imperatives are profits and growing investments in global power structures unmoored from any form of accountable, democratic governance. The devastating fallout of neoliberal capitalism’s reorganization of society — the destruction of communities and impoverishment of individuals and families — now becomes its most embraced mode of expressionas it is championed, ironically, as the only viable route to economic stability. 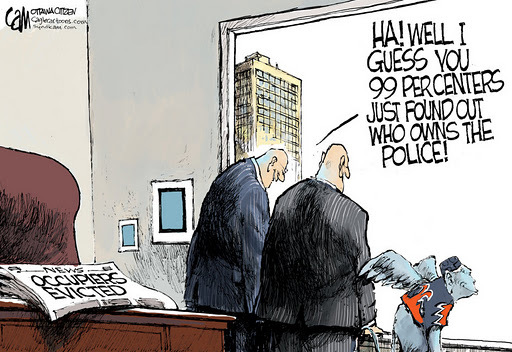 In this widely accepted, yet dystopian world view, collective misfortune is no longer interpreted as a sign of failing governance or the tawdry willingness of politicians to serve corporate interests, but attributed to the character flaws of individuals and defined chiefly as a matter of personal responsibility. In fact, government-provided social protections are viewed as pathological. Matters of life and death are removed from traditional modes of democratic governance and made subject to the sovereignty of the market. In this new age of biocapital, or what Eric Cazdyn calls “bioeconomics,” “all ideals are at the mercy of a larger economic logic” — one that unapologetically generates policies that “trample over millions of people if necessary.” Neoliberalism’s defining ideologies, values, and policies harness all institutions, social practices, and modes of thought to the demands of corporations and the needs of the warfare state. They are as narrowly self-serving as they are destructive. As collective responsibility is privatized, politics loses its social and democratic character, and the formative culture necessary for the production of engaged critical agents is gravely undermined. An utterly reduced form of agency is now embodied in the figure of the isolated automaton, who is driven by self-interest and eschews any responsibility for the other. As Stuart J. Murray points out, neoliberalism’s totalizing discourse of privatization, commodification, deregulation, and hyper-individualism “co-opts and eviscerates the language of the common good.” The ascendancy of neoliberal ideology also manifests in an ongoing assault on democratic public spheres, public goods, and any viable notion of equality and social justice. As corporate power is consolidated into fewer and fewer hands, ideological and structural reforms are implemented to transfer wealth and income into the hands of a ruling financial and corporate elite. 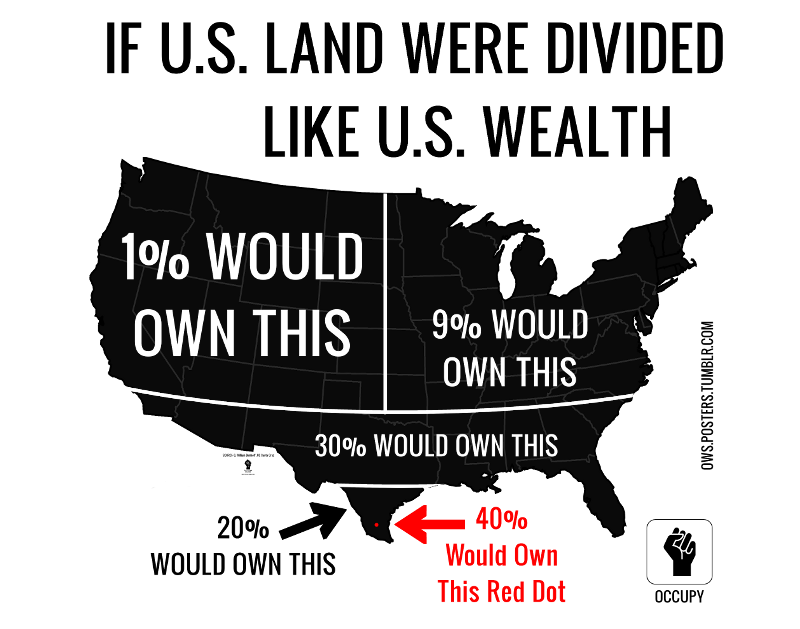 This concentration of power is all the more alarming since both Canada and the United States have experienced unprecedented growth in wealth concentration and income inequality since the 1970s. In Canada, as Bruce Campbell notes, “The richest Canadian 1% has almost doubled its share of the national income pie — from 7% to almost 14% — over the last three decades. The average top 100 CEOs’ compensation was $6.6 million in 2009, 155 times the average worker’s wage [while] 61 Canadian billionaires have a combined wealth of $162 billion, twice as much as the bottom 17 million Canadians.” The United States holds the shameful honor of being “perched at the very top of the global premier league of inequality,” with 1 percent of Americans holding 40 percent of all wealth and 24 percent of all income. Fraud and corruption now run rampant through the financial sectors of many advanced industrial countries, burning everything in their path. As Charles Ferguson points out, “major U.S. and European banks have been caught assisting corporate malfeasance by Enron and others, laundering money for drug cartels and the Iranian military, aiding tax evasion, hiding the assets of corrupt dictators, colluding in order to fix prices, and committing many forms of financial fraud.” In light of the recent scandals exposing the predatory practices and criminal acts of financial institutions such as HSBC, JPMorgan Chase, and the banking giant Barclays, it is clear that the financial sector has devolved into a financial oligarchy and a global criminal enterprise. A dire consequence of growing inequality is that more and more people are facing joblessness and poverty and being written out of a future that might offer them a decent and dignified life. What many have learned the hard way in North America and across the globe is that the impacts of inequality cannot be adequately captured with empirical measures based on the Gross National Product or median incomes. Inequality has a lived quality in which there is “a fatal attraction between poverty and vulnerability, corruption and the accumulation of dangers, as well as humiliation and the denial of dignity.” Young people, particularly those transitioning to independent adulthood, have certainly felt the brunt of the intensification of neoliberal policies and are increasingly unemployed, deprived of the most basic social provisions, denied access to decent health care and affordable housing, and are faced increasingly with diminished educational opportunities. Zygmunt Bauman argues that today’s youth have become “outcasts and outlaws of a novel kind, cast in a condition of liminal drift, with no way of knowing whether it is transitory or permanent.” That is, the current generation of youth has no way of grasping if they will ever “be free from the gnawing sense of the transience, indefiniteness, and provisional nature of any settlement.” And those young people further marginalized by race and class now inhabit a social landscape in which they are increasingly disparaged as flawed consumers, with no adequate role to play and so considered disposable, while forced to inhabit “zones of social abandonment” extending from bad schools to bulging detention centers and prisons. With so many young people globally facing a present whose future promises only to preserve and expand those spaces that have become sites of “terminal exclusion,” youth in North America and Europe have exhibited a growing recognition that the real marker of their generation is an ever-expanding mode of precarity. Increasingly stripped of their dignity as students and workers, student protesters in both the United States and Canada have recognized that“the current mode of production and reproduction has become a mode of production for elimination, a reproduction of populations that are not likely to be productively used or exploited but are always already superfluous.” By some estimates, “Nearly 75 million young people around the world are out of work, an increase of four million since the economic crisis of 2008.” Youth unemployment rates in Europe are staggering, reaching as high as 50 percent in both Spain and Greece and over 35 percent in Ireland. In the United States, 53 percent of recent college graduates are either unemployed or underemployed. Regardless of its diminished promise of social and economic mobility, higher education now subsidizes institutional budgets with exorbitant tuition rate hikes that effectively prevent working-class and many middle-class youth from even getting an education. Nowhere is the precarity that defines the current state of young people more obvious than in the consequences they face daily as the social state is being dismantled, individual rights are effaced, political freedoms are criminalized, and collective rights are all but obliterated. Increasingly unemployed, pushed into poverty, politically disenfranchised, and subject to the discipline of a growing punishing state, young people across the globe face a bleak future marked by uncertainty, vulnerability, insecurity, and the burden of mounting debt. Instead of being viewed as a crucial social investment, many youth — especially protesting students and minorities of race and class — are now the objects of law and order, caught in an expanding web of surveillance, criminalization, and governing-through-crime modes of social control. It is precisely against this background of expanding policies of neoliberal austerity, precarity, despair, diminishing expectations, and state violence that young people in Quebec have organized a protest movement that may be one of the most “powerful challenges to neoliberalism on the continent.” Thousands of students have raised their voices in unprecedented opposition to the ideology, modes of governance, and policies of the neoliberal state. The initial cause of the protest movement began in response to an increase in tuition fees announced by the Quebec provincial government in March 2011. The tuition hike was “part of the government’s effort to advance neoliberalism in Quebec by introducing new fees for public services and raising existing ones.” The government’s proposal included raising tuition by $325 per year over five years with the increased fees going into effect in September 2012. The hike amounted to a 75% increase over five years, rising from $2,319 to $3,793 by 2017. In February 2012, after the government refused to negotiate with organizations representing student interests, the student leaders called for a strike. Tens of thousands of students responded immediately by boycotting their classes. Many of the province’s colleges and universities were shut down as a result. Mainstream media consistently sided with the Quebec government, downplaying the significance of the tuition increases — even as they pertained to those students who could least afford them and for whom it would have the greatest impact. Critics of the strike repeatedly drew the public’s attention to the fact that, even with the increase, tuition fees in Quebec would remain among the lowest in Canada: “Average undergraduate tuition in Canada for 2011-12 is $5,366, but ranges widely from province to province. Quebec has the lowest fees, followed closely by Newfoundland and Labrador. Ontario has the highest average tuition, at $6,640 a year.” However, it soon became apparent that the students viewed the tuition increase as only one symptom of an ailing and unjust social order about which they could no longer be silent. The students preferred to speak for themselves rather than have others speak abstractly for them and about them, especially when it came to the material conditions of their own educations, their own futures. It is telling, and will remain telling, that government officials and newspaper pundits insistently responded with anxious indignation, as if wholly caught off guard by the simple fact that the students can speak — and speak intelligently, passionately, and urgently about the most pressing issues facing themselves and their society. In a reversal of roles familiar to anyone who actually works in a classroom, the student can also teach the teacher. The first lesson to be learned from striking students was that the protests were about much more than fee structures. Yet, the government seemed unwilling to assimilate this pedagogical insight, and its heavy-handedness touched a nerve in the larger social body of Quebec, activating new forms of dissent and solidarity. What quickly developed was a student strike of unprecedented proportions, involving more than 200,000 students and rallying many additional supporters for a mass demonstration on March 22, 2012. 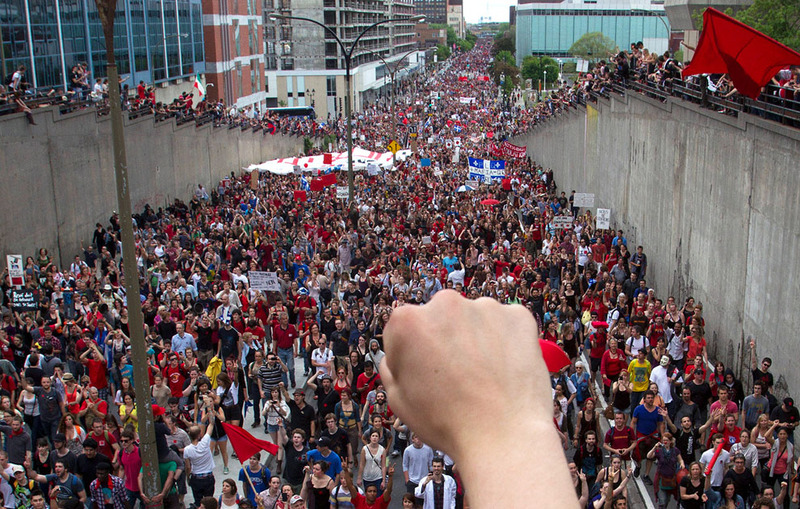 As the strike progressed and expanded its base of support, over a quarter of a million joined the demonstrations on a number of occasions and an estimated half million people marched in Montreal on May 25, 2012. By July 2012, the Quebec student strike had emerged as not only “the longest and largest student strike in the history of North America,” but also “the biggest act of civil disobedience in Canadian history.” The student action, which began as a protest against the provincial government’s plan to increase tuition fees, has developed into a popular uprising with tens of thousands of post-secondary students and their supporters marching nightly in the streets of Quebec cities and in solidarity demonstrations across Canada. 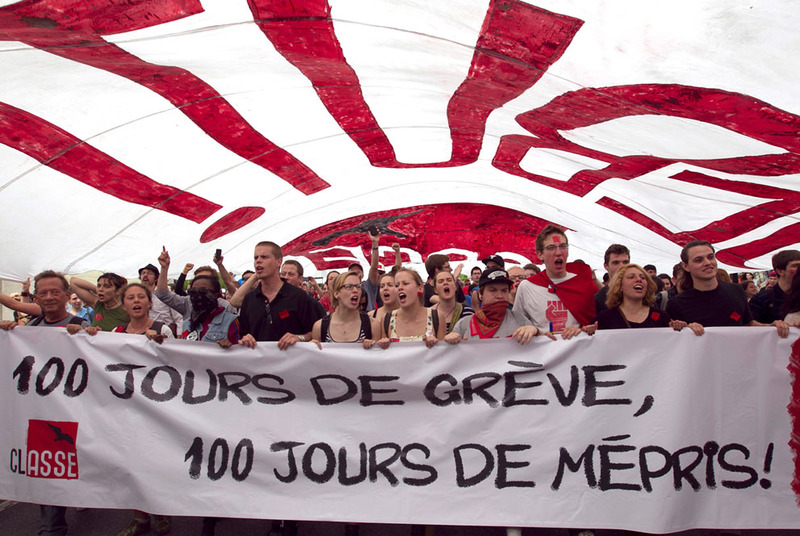 Now a major broad-based opposition movement against neoliberal austerity measures, the Quebec student strike initiated one of the most powerful, collectively organized challenges to neoliberal ideology, policy, and governance that has occurred globally in some time. The initial phase of the movement focused almost exclusively on higher educational reform. The issues addressed in the early stage of the protests included a rejection of the province’s call for a tuition increase, a sustained critique of the under-funding of post-secondary education, a critical interrogation of the perils facing a generation forced to live on credit and tied to the servitude of debt, and the opening up of a new conversation about the meaning and purpose of education — in particular, the kind of educational system that is free and removed from corporate influences, and whose mission is defined by its commitment to justice, equality, and support for the broader public good. Students rejected the tuition hike by arguing that the increase would not only force many working-class students to drop out but also prevent economically disadvantaged students from gaining access to higher education altogether. Expanding this critique, many young people spoke of the tuition increase as symbolic of repressive neoliberal austerity measures that forced them to pay more for their education, while offering them a diminished future of dismal job prospects when they graduated. Situating the protest against tuition hikes within a broader critique of neoliberal austerity measures, students were then able to address the fee hikes as part of the growing burden of suffocating debt, government funding priorities that favor the financial and corporate elite, Canadian Premier Harper’s ruinous transfer of public funds into an expanding military-industrial complex, and the imposition of corporate culture and corporate modes of governance on all aspects of daily life. 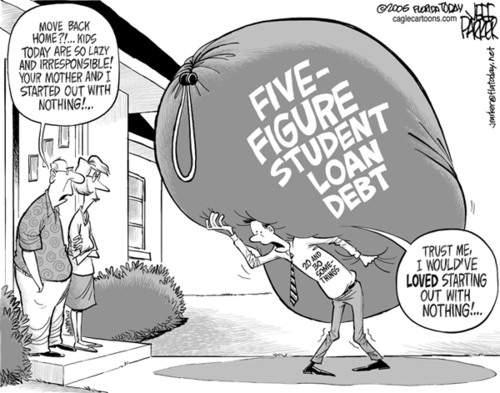 Total student debt now stands at about $20 billion in Canada ($15 billion from Federal Government loans programs, and the rest from provincial and commercial bank loans). In Quebec, the average student debt is $15,000, whereas Nova Scotia and Newfoundland have an average student debt of $35,000, British Columbia at nearly $30,000 and Ontario at nearly $27,000. Roughly 70% of new jobs in Canada require a post-secondary education. Half of students in their 20s live at home with their parents, including 73 per cent of those aged 20 to 24 and nearly a third of 25- to 29-year-olds. On average, a four-year degree for a student living at home in Canada costs $55,000, and those costs are expected to increase in coming years at a rate faster than inflation. It has been estimated that in 18 years, a four-year degree for Canadian students will cost $102,000. Defaults on government student loans are at roughly 14%. The Chairman of the Canadian Federation of Students warned in June of 2011 that, ‘We are on the verge of bankrupting a generation before they even enter the workplace.’ The notion, therefore, that Quebec students should not struggle against a bankrupt future is a bankrupted argument. The Quebec protesters made clear how rising tuition fees could be connected to the savage dictates of a debt machine that increases the profits of banks and other financial institutions. But they also went further and raised broader questions about what kind of university system would support such measures. In doing so, they have called into question the increasing corporatization of the university with its market-oriented view of governance, its valuing of research in instrumentalized market terms, its substitution of training for broad-based education, and its view of higher education as a commercial entity. Writing about the Quebec strike, Malav Kanuga states, “For the students there has been a growing sense of urgency and a shared recognition that increased tuition means a heavier student debt burden, hundreds of more hours a year spent working instead of studying, less access for working-class students, and a shift in university culture toward the market, the commodification of education, the financialization of student life, and the privatization of the university.” But the student activists have not simply denounced the university’s role in the reproduction of neoliberal values, gated communities for the affluent, and the engines of social and economic inequality. Student protesters have also strongly argued for a wholesale transformation of higher education in terms of both its mission and how it is funded. Moving from “the crisis of negation” to a project of transformation, the protesters have argued for higher education to be not only free and accessible to all students, but also dedicated to the role of educating students to take intellectual risks, think imaginatively, and assume the social responsibilities of critically engaged citizens. The Quebec student protesters are correct in their demand that Canadian society needs a wholesale revision of how educational institutions and democracies in general listen to and treat young people in a world in which their voices, needs, desires, and growing hardships have been excluded from a public space of articulation. The students have passionately rejected the neoliberal view of higher education as an economic investment unapologetically designed to turn students into consumers and the university into a profit-making entity. They have been strongly critical of neoliberal modes of governance which impose a top-down business culture on faculty, demanding that they assume the role of entrepreneurs rather than autonomous and critically engaged teachers and scholars. In addition, they have rejected the restructuring of academic departments into revenue production units and classrooms into training grounds that mimic the business culture of call centers and Wal-Mart. Presenting an alternative to the neoliberal model, Quebec students have argued for higher education as a democratic public sphere that does more than provide private returns for individuals and institute policies that aim to banish forever the “horrors” of teaching students to question authority. They have demanded the kind of education that takes seriously the impending challenges of a global democracy and will enable them to mediate the world in terms of democratic rather than commercial values. to clarify for a broad swath of society that a tuition hike is not a matter of isolated accounting, but the goal of a neoliberal austerity agenda the world over. Forcing students to pay more for education is part of a transfer of wealth from the poor and middle class to the rich — as with privatization and the state’s withdrawal from service provision, tax breaks for corporations, and deep cuts to social programs. The hidden order of politics at the center of neoliberal austerity measures is difficult to miss and helps explain the misplaced priorities of a Quebec government that in 2006-2007 provided $437 million for funding private schools — funds that, as Erika Shaker points out, “would pay for a fee freeze at Quebec universities and have money left over for bursaries for low-income students [while] the remainder could be redirected towards public schools.” Shaker suggests that this transfer of funds “demonstrate[s] that when public money is used to facilitate private access, it’s the public infrastructure and the people accessing it who pay the price.” The defunding of the social state and higher education and the increasing attack on the social contract are also evident in the Canadian state’s willingness in the latter half of the 1990s “to reduce by 50% the federal transfers to the provinces for post-secondary education [which has amounted] to a loss of income of $800 million per year for Quebec.” Federal funds that could be used for investing in higher education have instead been reallocated in keeping with the conservative government’s tough-on-crime agenda and either squandered on prison expansion or diverted into a growing Canadian military budget. Current tuition fee increases would raise about $200 million from students; yet such fees could be completely eliminated and free education provided to all students if the Canadian government cut back on its bloated military budget. Quebec Premier Jean Charest and his fellow apostles of neoliberalism had no trouble contributing $4.5 billion in 2011 to the $24.7 billion that “the Canadian government is spending…on its military budget, a budget that is proportionally higher today than it was during the Cold War” and now ranks Canada 14th in the world on military spending. Downloading more costs to the provinces, the federal government refuses assistance by offsetting rising student tuition fees and pushing ahead with a military budget that includes “the purchase of 65 F-35 planes at a cost of $462 million each.” Eliminating just one of these planes in the military budget would cover the cost of choosing not to raise tuition fees in Quebec. The asymmetry of the situation would be laughable if it were not so grotesque: students are vilified as irresponsible for protesting against tuition fee increases, while the Department of National Defence spends billions at will and remains mostly unopposed. Commentators in the national newspapers bleat about the putative naiveté or selfishness of Quebec youth, but remain conspicuously mute about the increased militarization of the culture, even as Canada attempts to extricate itself from a disastrous and costly war in Afghanistan. The current neoliberal governments at the federal and provincial levels express little or no concern about providing students with quality higher education or supporting investment in universities, libraries, health care, or a jobs creation program for young people. Certainly for the Harper regime, it appears such social investments are viewed as far less important than siphoning off billions to fund a culture of violence and a permanent war machine. Misplaced priorities that shut down economic, educational, and political opportunities suggest that Canada has become a society that is waging a war on its children, even as government policies increasingly reveal the savagery of a system that considers profits more important than the lives of its citizens. The student strike emerged in February 2012 when it became clear that Premier Charest and the Quebec government were not interested in opening up a dialogue with Quebec’s major student unions. Various student groups then joined hands and organized a massive strike of 40,000 students on February 21, 2012. As the strike became more cohesive under the leadership of the CLASSÉ — the Coalition large de l’Association pour une Solidarité Syndicale Étudiante, Quebec’s largest student association and the most vocal in supporting direct action and rejecting the regime of neoliberal capitalism — the tactics employed by the students became both more disruptive and more effective. The strike in turn alarmed a number of business elites, conservative media pundits, and members of the Charest government. Not surprisingly, the business community in the province supported both the government’s effort to raise tuition and its use of state force to crush the strike. Roger Annis notes that “The Conseil du Patronat du Québec (Employers Council of Quebec) issued the results of a survey of its members on June 1 showing 95 percent support for the government’s proposed hike in tuition fees that sparked the student strike last February and 68 percent support for Bill 78” — the latter referring to legislation whose purpose is largely viewed as an attempt to break the student unions, suppress democratic expression, bankrupt individuals, and undermine the unity and solidarity that has been forged among the largest student groups. In this view, the real culprits are the youth — characterized by their alleged moral turpitude and declining values — instead of a global financial meltdown caused by the willingness of finance capitalism to sacrifice the future of young people for short-term political and economic gains. For Wente, the issue that the protesters should really be addressing is the necessity to rid higher education of those academic disciplines not directly tied to the market because the only purpose of education in her instrumentalist world view is to train people for the neoliberal order she so fervently defends. Some critics have gone further than Wente and called for outright violence to be used against the protesters. Roger Annis claims that not only were many business leaders in favor of using the police to crush the strike, but many “politicians and editorialists were calling for greater use of police violence and court injunctions to break up student picket lines.” Michael Den Tandt, writing in the National Post, was quite explicit in calling for the government to crack down on the protesters, going so far as to suggest dishing out medieval forms of punishment such as “caning.” Bernard Guay, a member of the Quebec Liberal Party and head of the tax office in the Municipal Affairs Department, published a letter on the website of Le Soleil in which he unapologetically recommended“using the fascist movements of the 1920s and 1930s as an example in how to deal with ‘leftists’ in giving them ‘their own medicine.’ He suggested organizing a political ‘cabal’ to handle the ‘wasteful and anti-social’ situation, which would mobilize students to not only cross picket lines, but to confront and assault students who wear the little red square (the symbol of the student strike).”  Imitating fascist thuggery, Guay suggested, would “help society ‘overcome the tyranny of Leftist agitators.’” In spite of their differences, these attacks all share what New York Times columnist Frank Bruni has called in a different context an “emphasis on personal advantage over the public good.” One might conclude that they all exhibit a hatred for democracy itself. While Premier Charest eventually agreed to open up talks with the main student groups, he held fast to student tuition increases, though he later made a paltry offer to lower the rate of increase. It is impossible to determine if the bellicose assault against the protesters in the mainstream media, along with the support of a large portion of Quebec’s business community, encouraged the Charest government to resort to repressive measures. 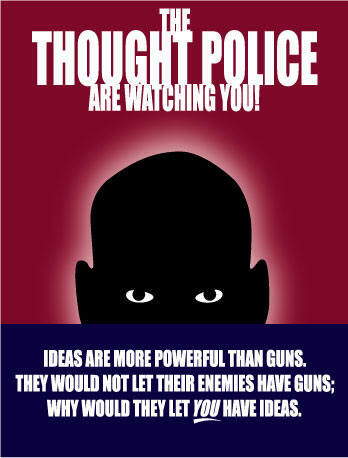 However, it did just that by passing Bill 78 into law on May 18, 2012 — and proceeding to implement anti-protest legislation that gave sweeping powers to the police and was designed to suppress peaceful protests and shut down student opposition, while violating the most basic rights of free speech, association, and assembly. Representing the dissent expressed by the students “as a criminal rather than political issue,” the emergency legislation was a desperate attempt to portray the protest movement as an act of criminality and students as figures of lawlessness, despite the validity of the issues being raised and the general peacefulness of the student demonstrations. In the service of legitimating an alarmist set of regulations and substituting an emotional discourse for a reasoned and thoughtful attempt at dialogue, Law 12 (formerly Bill 78) proved to be a draconian piece of legislation so extreme that Montreal police have expressed reluctance about enforcing certain parts of it. The most prohibitive and irresponsible measures of Law 12 include: giving the police eight hours’ notice and a precise itinerary for any demonstration involving more than 50 people; fines running as high as $125,000 for unions and student federations and $35,000 for individuals that violate the law; giving police the power to prosecute a person if he or she offers support or encouragement to protesters at a school; making it illegal for any demonstration to be held within 50 meters of any school campus; giving the government the right to order faculty and staff to show up for work on any designated day; and doubling all fines for repeat offenders. But Law 12 is much more than a gross violation of the rights of students to engage in peaceful assembly and protest austerity measures aimed at curtailing access to post-secondary education. It also provides a green light for police violence, making clear that the state would employ aggressive levels of force against students and others in the face of its refusal to address major social and economic problems through peaceful public dialogue and debate. The government’s decision to assume a defensive posture on behalf of rich elites and corporate power backfired, and the passage of Bill 78 in May 2012 signified a major turning point for the Quebec protest movement. Rather than succeed in creating a climate of fear in order to intimidate students, faculty, and other sympathizers, the law outraged both civil libertarians and ordinary citizens and became a catalyst for attracting a much wider following of non-student supporters. Not only did public anger explode in a massive demonstration on May 25 in which an estimated 500,000 people marched, it also inaugurated nightly demonstrations in Montreal neighborhoods in which people in the streets and on balconies banged their pots and pans at 8:00 pm to protest the law as an act of public support and solidarity for the students. Inspired by the pots and pans movement that developed in Chile in the ’70s, the “casseroles” demonstrations in Montreal and other cities functioned as a mode of collective performance and a loud but peaceful way to express public outrage and disgust at the Charest government. In addition, crowds of supporters embraced the red square as a symbol of resistance to a future of debt (being “squarely in the red”), pinning it on their clothing and waving red flags from their balconies, offering up a powerful symbolic image of defiance as a way to demonstrate their anger over a generation of young people being trapped in a ruinous system of usurious credit and loans. This burden is one that we all shoulder, each and every one of us, whether we are students or not: this is one lesson our strike has taught us. For we, students, are also renters and employees; we are international students, pushed aside by discriminating public services. We come from many backgrounds, and, until the color of our skin goes as unnoticed as our eye color, we will keep on facing everyday racism, contempt and ignorance. We are women, and if we are feminists it is because we face daily sexism and roadblocks set for us by the patriarchal system; we constantly fight deep-rooted prejudice. We are gay, straight, bisexual, and proud to be. We have never been a separate level of society. Our strike is not directed against the people. We are the people. Our strike goes beyond the $1625 tuition-fee hike. If, by throwing our educational institutions into the marketplace, our most basic rights are being taken from us, we can say the same for hospitals, Hydro-Québec, our forests, and the soil beneath our feet. We share so much more than public services: we share our living spaces, spaces that were here before we were born. We want them to survive us….This is the meaning of our vision, and the essence of our strike: it is a shared, collective action whose scope lies well beyond student interests. We are daring to call for a different world, one far removed from the blind submission our present commodity-based system requires. Individuals, nature, our public services, these are being seen as commodities: the same tiny elite is busy selling everything that belongs to us. And yet we know that public services are not useless expenditures, nor are they consumer goods. In Badiou’s terms, these documents demonstrate a strategy for changing a temporary event into a political organization capable of mobilizing a united idea in the service of an historical awakening. In both its ideas and actions, the Quebec protest movement is clearly channelling more than the defanged spirit of revolt that Slavoj Žižek warned might dilute the Occupy Wall Street movement. Not only does the Quebec movement symbolize “the awakening of democratic values,” but it also signals the birth of a revolutionary idea grounded in the reality of burgeoning collective organizations and a “minimal positive program of socio-political change.” Debates about rising tuition rates are now tied to debates about inequality, economic injustice, racial discrimination, the corporatization of education, the destruction of public spheres, and the expanding number of societies willing to wage war on their youth. At the same time, the transformation of the student movement in Montreal into a social movement has not been without challenges. As the Quebec student movement gains in strength and develops into a broad popular uprising intent on transforming government policy and reconfiguring the lines of political and economic power, state-sanctioned law enforcement has resorted to more violence. Thousands of students have been arrested, one young person lost an eye, and there have been numerous reports of excessive force used on peaceful demonstrators. Such violence appears to replay the horrific attacks by the police on students occupying university campuses in the United States. In both instances, the emerging specter of a police state canceled out the fictive portrayal of young people as insignificant whiners and self-indulgent brats manufactured by the conservative media, pundits, and government officials. Quite to the contrary, students are making themselves increasingly visible as the harbingers of a social movement willing and capable of challenging the neoliberal nightmare. And because they are more visible, they are more vulnerable to state violence. Another distinctive characteristic of the Quebec movement is that it has clearly positioned young people as part of the 99%. In doing so, it has connected with and gone far beyond the limited tactic of mass mobilizations. Protesting students have opted instead for a permanent presence and media profile through ongoing demonstrations, study groups, media outreach, community engagement, policy interventions, and performance art. Thinking otherwise in order to act beyond the boundaries of the given has been a characteristic of the Quebec student movement from its inception. These brave young students have not only appropriated the language of the dare by displaying their civic courage, but also provided a concrete expression of what can be called “educated hope”. The student protesters have given new meaning to what the philosopher Ernst Bloch once referred to as “something that is missing,” and, in so doing, have resurrected a claim on a future that does not imitate the present. And while the Quebec resistance movement shares the spirit of direct democracy evident in the Occupy movement, it has extended its critique of neoliberalism and its embrace of the principles of participatory democracy beyond the boundaries of the nation-state, singular political issues, and temporary political organizations. It has connected its democratic project to other student movements in Chile, England, and the United States as well as to a growing worldwide resistance to global capitalism. And it has discerningly provided an overarching discourse in which it can address a number of related political and economic issues that produce mass suffering and human hardships. In offering the public a new language through which to challenge neoliberal prerogatives, Quebec youth have made clear that the financial and corporate interests at work in the drive to raise tuition and push thousands of students into bankruptcy are also responsible for privatizing public services, raising and creating new user fees for health care, eliminating public sector jobs, closing factories, exploiting natural resources for financial gain, extending the retirement age, curbing the power of trade unions while slashing their benefits, promoting tax cuts that benefit the rich, and criminalizing social problems — and those who dare to protest such actions. Moreover, the Quebec student movement has raised important questions about the role of the university in society and what relationships will exist in the future between corporate power and all aspects of public and political life. What is unique about the Quebec movement is how organized it has been — a reflection of how the students prepared for the demonstrations before they actually took place by networking and mobilizing small groups to talk to peers, faculty, staff, union representatives, and workers. In addition, the students developed broad-based and powerful associations through which they could advocate for issues directly related to educational reform rather than outward-facing advocacy movements such as those organized by U.S. students, one example of which is the anti-sweatshop movement. By developing strong unions with demands rooted in knowledge gained from their own lived experiences and the plight of the university, it became easier for the protesters to retain a distinct identity while reaching outside of the university to create a broad-based movement. Moreover, the students organized around an idea — simply that tuition hikes need to be addressed within the suffering and injustices produced by neoliberal austerity measures — which proved revolutionary in its scope, flexible in its ability to connect to other forms of oppression, and decisive in mobilizing other students and the public at large. The Occupy movement began with a slogan about the 99%, but it lacked the student unions, organizational skills, and sustainable strategies employed by Quebec youth. Of course, the system of higher education in the United States is more complex given its mix of public and private universities, but this should not prevent the emergence of massive and shared organizational initiatives to develop student organizations at local, state, and national levels. In addition, the Quebec students developed what Peter Hallward has called a culture of solidarity and confrontation. This strategy was designed to win over students and public opinion while refusing to compromise with official power. For instance, when the major unions suggested that the students accept a government offer that would not have lowered tuition fees, the students refused what they thought was a compromising position taken by the unions. They also rejected as insignificant a government offer “to reduce the proposed tuition hike by $35.00 a year over seven years.” At the same time, the ongoing strike and widening boycott confronted daily the oppressive power of the state. In doing so, the students made visible on a continuing basis their concerns and the need to extend the ideological and political parameters of their grievances against the state, and neoliberalism in general. Clearly, this is something the Occupy movement should be doing rather than focusing on largely disparate and isolated events. Both the Occupy movement and the Quebec student resistance now face the ongoing challenge of developing a language and politics that begins with a meaningful consideration of public life and public values, and tells a story about the possibilities of an insurrectionist democracy not wedded to the dictates of global capitalism. The key challenge for thesegroupswill be to sustain this story in the public sphere through forms of political organization that areas coordinated as they are flexible and open to new ideas. In addition, there is the crucial need to develop alternative and sustainable educational institutions and public spaces in which matters of knowledge, desire, identity, and social responsibility become central to creating a democratic formative culture — understood as the very precondition for the modes of agency and engaged citizenship necessary for any just and inclusive society. This formative culture must make pedagogy central to its understanding of politics and work diligently to provide alternative narratives, stories, subjects, power relations, and values that point to a future when young people and all those others excluded from the savage politics of casino capitalism will create a society in which justice and dignity mutually inform each other. The Quebec student resistance faces a number of crucial challenges as the fall school semester begins in September. If the strike continues, many students will get failing grades and be forced in some cases to make up a semester of work. 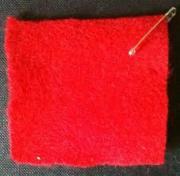 The Charest government is banking on the support of a public that seems to be getting weary of the strike. At the same time, if the demonstrations continue, there is sure to be more police violence and arrests, especially as state repression is now sanctioned by law. But regardless of how the Quebec movement turns out, the protesters have demonstrated a degree of courage, skill, organization, and solidarity that will not easily fade away. A revolutionary idea has been born and now waits for the conditions through which it can become a more powerful, inspiring political and moral force.
. I want to thank Grace Pollock, Maya Sabados, Danielle Martak, and David L. Clark for their excellent editing suggestions.
. Eric Cazdyn, “Bioeconomics, Culture, and Politics after Globalization,” in Cultural Autonomy: Frictions and Connections, ed. Petra Rethmann, Imre Szeman, and William D. Coleman (Vancouver: UBC Press, 2010), p. 64.
. Alain Badiou, The Rebirth of History, trans. Gregory Elliott (London: Verso, 2012), p. 12.
. Stuart J. Murray, “The Voice of the We Yet to Come,” Canadian Journal of Communication (in press), p. 2.
. Zygmunt Bauman, This Is Not a Diary (Cambridge: Polity Press, 2012), p. 103.
. Joseph Stiglitz, The Price of Inequality: How Today’s Divided Society Endangers Our Future (New York: W. W. Norton, 2012).
. Some recent and important literature on this issue includes: Charles Ferguson, Predator Nation: Corporate Criminals, Political Corruption, and the Highjacking of America (New York Random House, 2012); Jacob Hacker and Paul Pierson, Winner-Take-All Politics: How Washington Made the Rich Richer — and Turned Its Back on the Middle Class (New York: Simon & Schuster, 2011); David Harvey, The Enigma of Capital and the Crises of Capitalism (New York: Oxford University Press, 2011); Paul Krugman, End This Depression Now! (New York: W. W. Norton, 2012); Jeff Madrick, Age of Greed: The Triumph of Finance and the Decline of America, 1970 to the Present (New York: Vintage, 2012); Stiglitz, The Price of Inequality; and Richard D. Wolff and David Barsamian, Occupy the Economy: Challenging Capitalism (San Francisco: City Lights Open Media, 2012).
. Ferguson, Predator Nation, p. 2.
. Zygmunt Bauman, Living on Borrowed Time: Conversations with Citlali Rovirosa-Madrazo (Cambridge: Polity, 2010), p. 68.
. Zygmunt Bauman, Wasted Lives (London: Polity, 2004), p. 76.
. I have borrowed the term “zones of social abandonment” from Joäo Biehl, Vita: Life in a Zone of Social Abandonment (Berkeley: University of California Press, 2005); see also Henry A. Giroux, Disposable Youth (New York: Routledge, 2012) and Michelle Alexander, The New Jim Crow (New York: The Free Press, 2012).
. Etienne Balibar, We, The People of Europe? Reflections on Transnational Citizenship (Princeton: Princeton University Press, 2004), p. 128.
. Editorial, “Global Youth Jobless Rates Still High,” Hamilton Spectator (May 23, 2012), p. A17.
. Zygmunt Bauman, Liquid Modernity (Cambridge: Polity, 2001).
. See Zygmunt Bauman, Collateral Damage: Social Inequalities in a Global Age (Cambridge: Polity, 2011); Stiglitz, The Price of Inequality; Lynn Parramore, “Exclusive Interview: Joseph Stiglitz Sees Terrifying Future for America If We Don’t Reverse Inequality,” AlterNet (June 24, 2012), online:http://www.alternet.org/economy/155918/exclusive_interview%3A_joseph_stiglitz_sees_terrifying_future_for_america_if_we_don%27t_reverse_inequality; Paul Buchheit, “Five Facts That Put America to Shame,” CommonDreams (May 14, 2012), online: http://www.commondreams.org/view/2012/05/14-0; and Peter Elderman, So Rich, So Poor: Why It’s So Hard to End Poverty in America (New York: New Press, 2012).
. Bauman, Living on Borrowed Time, pp. 39-40.
. Jonathan Simon, Governing Through Crime: How the War on Crime Transformed American Democracy and Created a Culture of Fear (New York: Oxford University Press, 2007). See also Henry A. Giroux, Youth in a Suspect Society: Democracy or Disposability? (New York: Palgrave Macmillan, 2009).
. Andrew Gavin Marshall, “10 Things You Should Know About the Quebec Student Movement,” CounterPunch (May 23, 2012). 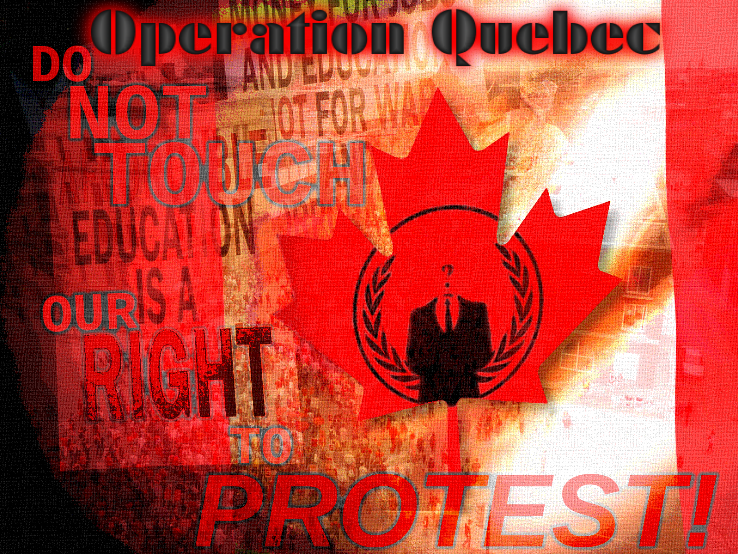 Online: http://www.counterpunch.org/2012/05/23/10-things-you-should-know-about-the-quebec-student-movement/. For a brilliant commentary on the history of debt and its effect on the economy, see David Graeber, Debt: The First 5,000 Years (Brooklyn: Melville House Publishing, 2011).
. Badiou cited in John Van Houdt, “The Crisis of Negation: An Interview with Alain Badiou,” Continent 1:4 (2011), p. 234.
. Badiou, The Rebirth of History, pp. 18-19.
. Frank Bruni, “Individualism in Overdrive,” New York Times (July 17, 2012), p. A25.
. Jacques Rancière, Hatred of Democracy (London: Verso, 2006).
. For a critique and summary of the bill, see Annis, “Quebec Students Mobilize”; CommonDreams staff, “’Biggest Act of Civil Disobedience in Canadian History’ ” CommonDreams (May 23, 2012), online: https://www.commondreams.org/headline/2012/05/23-5; Linda Gyulai, “Bill 78 Contravenes Charter, Lawyer Says,” The Gazette (May 23, 2012), online: http://www.montrealgazette.com/business/Bill+contravenes+charter+lawyer+says/6662877/story.html; Laurence Bherer and Pascale Dufour, “Our Not-So-Friendly Northern Neighbor,” New York Times (May 23, 2012), p. A31; and Ian Austen, “Emergency Law Broadens Canada’s Sympathy for Quebec Protests,” New York Times (June 5, 2012), p. A4.
. Badiou, The Rebirth of History.
. Badiou, The Rebirth of History, p. 56. This essay first appeared at Truthout.org as “The Quebec Student Protest Movement and the Power of the Radical Imagination”.